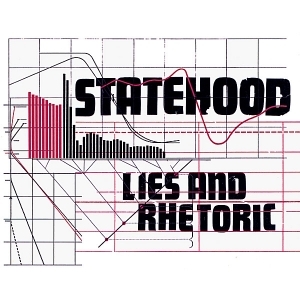 Statehood | Lies and Rhetoric! Ok, it's game time. After all this talk, all this waiting, never believing that November 19th even existed - it's happening. 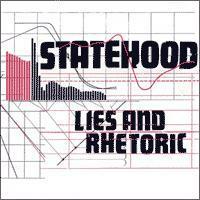 "Lies and Rhetoric" comes on Monday just about everywhere. See the MUSIC tab on our site to see where you can download or buy physical copies. If you don't see your favorite music purchasing place, well let us know, we'll look into it. Lots going on, press coming in, shows coming up, beards being trimmed. We don't have somewhere to collect press just yet, but in the meantime check out HEREfor a City Paper story about playing in a band and teaching at the same time. OrHERE for a story about what appears to be the favorite track on the record. OrHERE for a really nice and accurate review of what the record sounds like. We're playing shows this weekend, but when we get back we'll find a home for putting all these links. Shows. Right. Friday in Philadelphia with our friends Enon and Love of Diagrams. Haven't been to Johnny Brenda's before, but I've heard more than one touring band say it's the best club of it's size on the east coast. This sounds good. The next night, back to the Middle East in Boston. About 10 years ago I think I played there every three months like clockwork. I'm gonna eat about fifteen pounds of falafel that night, watch me. A few days later it's the CD release show at the Black Cat (Wednesday night). If you're home for the holidays, we'll see you there. If you not home for the holidays, change your plans. Thanks. Last thing - I went to go see the Police last week. On my list of bands I'd HAVE to go see if they reformed, they were about at the top (now that the Clash can't do this). Good to see the boys, and pay homage and give them my money and all - but Stewart didn't do the fill! Which fill? C'mon. At the end of "Every Little Thing" that amazing snare fill before the "E-O-O-E-O-O" ride out, one of the best five drums fills in the history of drum fills (yes, the other four are all John Bonham). I sat there waiting and waiting, and he blew right through it. I swear I yelled "nooooooooo" so loud that about four rows of people looked back to see what happened. As if they didn't know. I've gotten over it I think. Even heard it on the radio this weekend and hammered out the part on my steering wheel. Things are better now.